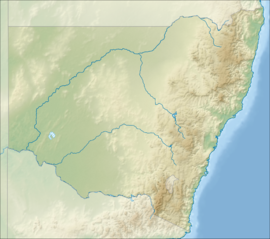 The Oak Creek Nature Reserve is a protected nature reserve in the Southern Tablelands region of New South Wales, in eastern Australia. The 404-hectare (1,000-acre) reserve is situated near the rural locality of Wee Jasper. The reserve was created in January 2001 as part of the Southern Regional Forest Agreement. Prior to this, the area was Crown land. ^ a b "Oak Creek Nature Reserve: Park management". Office of Environment & Heritage. Government of New South Wales. Retrieved 30 September 2014. ^ a b "Oak Creek Nature Reserve: Plan of management" (PDF). NSW National Parks & Wildlife Service (PDF). Government of New South Wales. September 2010. ISBN 978-1-74232-959-8. Retrieved 7 February 2012. This page was last edited on 11 June 2017, at 16:15 (UTC).